State highway agencies across the country are strategizing how they will deploy the 13 innovations featured in the second round of Every Day Counts, the Federal Highway Administration’s initiative to shorten project delivery and accelerate innovation deployment. Transportation professionals learned about eight of the technology initiatives during a series of fall 2012 regional summits around the country. They got in-depth information about the remaining five innovations during virtual summits in the spring. Meanwhile, State Transportation Innovation Councils—which include leaders of highway agencies and stakeholder organizations in each state—began determining which innovations to incorporate into their highway programs over the next two years. They prioritized their efforts based on need, safety and environmental concerns, and laws and regulations. FHWA teams are providing technical assistance to help state highway agencies and other stakeholders deploy their selected innovations. Based on feedback from Every Day Counts summit participants, the teams developed implementation plans for each innovation that include tactics such as training sessions, briefings, peer exchanges and demonstrations at which stakeholders can observe the use of innovations on projects and share best practices. With about two-thirds of states reporting, at least 34 highway agencies indicate they plan to participate in the Every Day Counts effort over the next two years to expand use of programmatic agreements, which save time and resources by establishing streamlined approaches to handling environmental requirements on projects. The Idaho Transportation Department, for example, plans to assess its bridge program for potential opportunities for time-saving agreements. The Missouri Department of Transportation will work with the U.S. Army Corps of Engineers on a programmatic agreement to address requirements under Section 106 of the National Historic Preservation Act. At least 34 departments of transportation will also participate in the effort on locally administered Federal-Aid projects, which is designed to help local public agencies navigate the complexities of the Federal-Aid Highway Program. The North Carolina Department of Transportation plans to create a prequalification and certification program to ensure that local government agencies meet compliance requirements for transportation projects. The Wyoming Department of Transportation will establish a Local Public Agency Steering Committee to foster dialogue among FHWA, state and local entities. So far, 32 states have agreed to participate in the effort to expand use of 3-D engineered models for construction, which allow for faster, more accurate and more efficient planning and construction. One is Pennsylvania, which will pursue two pilot projects, one aimed at improving efficiency and quality of construction with the use of automated machine guidance and another to improve project delivery time and project quality through the use of 3-D modeling in design. At least 35 states have put intelligent compaction on their deployment list. Intelligent compaction uses special vibratory rollers and GPS technology to improve the quality, uniformity and performance of pavements. The Tennessee Department of Transportation plans to develop guidelines on intelligent compaction project selection and use the technology on at least four project during the next two years. The Georgia Department of Transportation will use results from past and 2013 pilot projects to develop guidance and policies for using intelligent compaction on future projects. Some 35 states will implement accelerated bridge construction technologies, including prefabricated bridge elements and systems, slide-in bridge construction and geosynthetic reinforced soil integrated bridge systems. The Missouri Department of Transportation would like to build two bridges on the state system using GRS-IBS, which uses alternating layers of compacted granular fill and geosynthetic reinforcement to provide support for a bridge. It also would like to pursue slide-in bridge construction, which involves building a bridge on temporary supports next to an existing structure and sliding it into place, as an option on bridge projects. Although many states already use design-build contracting, which allows the design and construction phases of a project to be combined in one contract, at least 16 plan to pursue it under the second round of Every Day Counts. One is the California Department of Transportation, which has authorization to use design-build on up to 10 projects by January 2014 and has awarded eight of them already. The construction manager/general contractor method, which accelerates project delivery by involving the contractor early in the project, is on the implementation list for at least 18 states. The Delaware Department of Transportation plans to seek legislative approval to use the technique and develop a decision-making process, policies and procedures for using it. The Alaska Department of Transportation and Public Facilities plans to start construction on a project using the technique and select two more candidates. At least 18 states plan to pursue the use of alternative technical concepts over the next two years. The use of alternative technical concepts enables contractors to propose innovative options that are equal to or better than the state’s criteria during the project procurement process. The Maryland State Highway Administration has set a goal of using alternative technical concepts on 10 projects by the end of 2014, while the Montana Department of Transportation plans to use them on five projects. For more information on EDC-2 go to www.fhwa.dot.gov/innovation/everydaycounts/edc-2.cfm. States are making plans to implement Every Day Counts technology initiatives such as accelerated bridge construction techniques, new interchange and intersection designs, and intelligent compaction. "Our agency’s strategic goals address taking care of our facilities and assets and building projects on time and on budget. We are confident that Every Day Counts will assist us in meeting these goals." "Every Day Counts has and will continue to promote a unified focus by all stakeholders for the implementation of innovation in Vermont." "We had a group of contractors that actually had a lot of input into developing some of the construction manager/general contractor initiative. Everyone benefits when every day counts." "Every Day Counts has really been theseed to grow innovations within the Pennsylvania Department of Transportation." "Every Day Counts has provided tremendous focus and clarity on the things that are important nationally for us to be working on." "The biggest benefit of Every Day Counts events is to network with other DOTs–the decision-makers, the implementers–who have been involved in similar strategies and projects and see how they were able to overcome the challenges." "When we started with Every Day Counts, we talked about real outcomes. We had 1,168 structurally deficient bridges, and now we are down to 634. Through the Every Day Counts initiative, we expect to have zero structurally deficient bridges by 2019." Using virtual summits enabled the Federal Highway Administration to reach more people at less cost with information on five innovations being promoted during the second round of Every Day Counts. More than 2,400 professionals participated in the April 2013 summits. They were held at central locations in each state so that people did not need to travel a great distance to participate, but still had opportunities to network with peers. The web conferences used multiple virtual rooms, including a "summit central" room for technical presentations and national discussions, state caucus rooms for participants in each state to hold discussions, and a help room for posting questions for subject matter experts on each technology. Environment summits covered geospatial data collaboration, which uses web-based geographic information system services to improve data sharing among project delivery stakeholders, and quality environmental documentation, which promotes strategies to improve the quality of and streamline National Environmental Policy Act documents developed for construction projects. Safety summits focused on high-friction surface treatments that use high-quality aggregate to help reduce crashes and innovative intersection and interchange geometrics that increase safety for road users. Operations summits dealt with national traffic incident management responder training, also a second Strategic Highway Research Program priority, the first multidisciplinary traffic incident management process and training program. An executive-level summit for State Transportation Innovation Councils provided an overview of all five topics. Using technology allowed a broad range of stakeholders to take part in the summits. They represented state and local transportation agencies, metropolitan planning organizations, environmental and historical preservation organizations, trade and professional associations, contractors, suppliers, designers, consultants, law enforcement and public safety organizations. Through the Every Day Counts initiative, the Federal Highway Administration is taking action to train incident responders, those who are first on the scene to handle crashes, stranded vehicles and road debris. A cadre of well-trained responders can reduce the time it takes to clear incidents, saving lives, money and time. Three injury crashes occur every minute in the United States, according to FHWA statistics. These crashes potentially put 39,000 incident responders in harm’s way. Congestion from these incidents often generates secondary crashes, which further increase traffic delays and driver frustration. The longer incident responders remain at the scene, the greater the risk they face, along with the traveling public. The Transportation Research Board’s second Strategic Highway Research Program developed two products to improve traffic incident on-scene management. One is a multidisciplinary training course that promotes a shared understanding of the requirements for fast and safe incident clearance. The other is a train-the-trainer course that facilitates widespread use of the multidisciplinary training. "The EDC2 initiative for the SHRP 2 National Traffic Incident Responder Training consists of aggressive deployment through train-the-trainer sessions," said Paul Jodoin, manager of FHWA’s Traffic Incident Management Program. Jodoin was a speaker at the Every Day Counts virtual operations summit in April, which focused on national traffic incident responder training. First responders nationwide are undergoing training on how to clear traffic incidents safely and efficiently. The train-the-trainer curriculum is aimed at building a group of qualified trainers in each state or region, using a common set of practices and advanced standards. 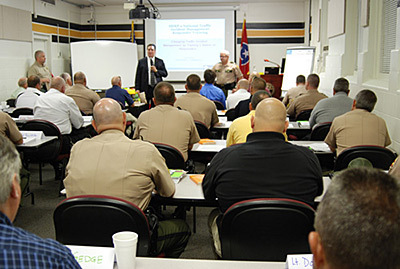 The training is delivered through interactive seminars, case study analysis, role playing and field practicums. The practicums focus on the safety of responders and drivers, quick clearance and effective communications at traffic incident scenes. The training focuses on a response effort that protects motorists and responders while minimizing the impact on travel flow and covers recommended procedures for incident management. For example, first responders learn how the placement of response vehicles can either aid or impede another discipline’s efforts and can impact how quickly traffic flow can be restored. Responders also learn about human behavior in highway safety to help prevent additional injuries or delays resulting from secondary crashes. Extensive research and testing have gone into the development of the traffic incident management training program. The training helps improve incident response, which enhances safety for both responders and drivers. Faster incident response and clearance times result in fewer secondary crashes, and the responder team undergoes less exposure to moving traffic. Moreover, the training saves money. In Atlanta, for example, improved incident clearance practices reduced secondary crashes by 69 percent in 12 months, saving lives and more than $1 million. Well-trained responders can cut clearance time in half, resulting in fewer freight and traveler delays. To learn more about FHWA’s Emergency Transportation Operations Program, visit www.ops.fhwa.dot.gov/eto_tim_pse. For more information on traffic incident responder training, contact an FHWA state division office. Details are at www.fhwa.dot.gov/innovation/everydaycounts/contacts.cfm. The Washington State Department of Transportation will install state-of-the-art barrier delineators and solar-powered light-emitting diode lane markers to enhance safety on Interstate 90 over Snoqualmie Pass. Credit: Washington State DOT. The Washington State DOT will install barrier-mounted delineators to improve safety in the Snoqualmie Pass area. The agency, which received a Highways for LIFE grant from the Federal Highway Administration for the project, is optimistic that the new delineators will require less-frequent repair and replacement than former systems and the lane markers will improve visibility during low-light times. "This grant funding gives us the opportunity to try this innovative technology in a difficult area," said Troy Suing, assistant regional administrator for project development at the Washington State DOT. It’s challenging for the agency to maintain roadway markings on the high mountain pass, where the annual average snowfall at the summit is 435 inches. About 29,000 vehicles a day travel over the pass, which is a strategic freight corridor carrying a high percentage of trucks. In addition to rain and snow obscuring roadway visibility, snow plows, studded tires, and tire chains cause heavy wear on pavement striping. "With the salt, the chains, the studs, the snow, the snow plows and the graders up there, it’s very difficult to keep lane delineation intact," said Suing. Collisions during low-light times of the day account for more than 40 percent of the total crashes in the Snoqualmie Pass area. 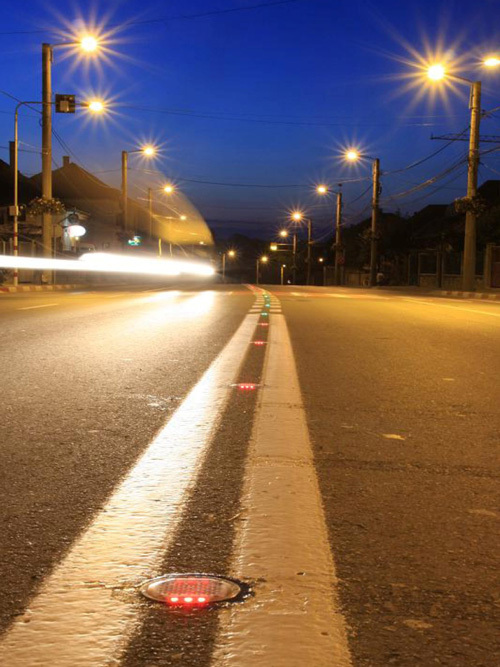 More than 75 percent of those low-light crashes occur from late fall to early spring, when lane delineation is most critical. 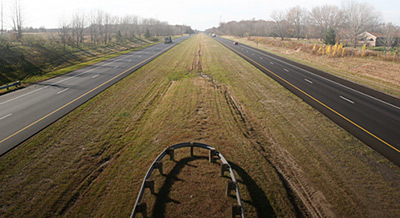 To help delineate the edge of pavement, the department will install the 3M™ Linear Delineation System for seven miles (11.2 kilometers) on the concrete Jersey barriers on both sides of the interstate and in the median. 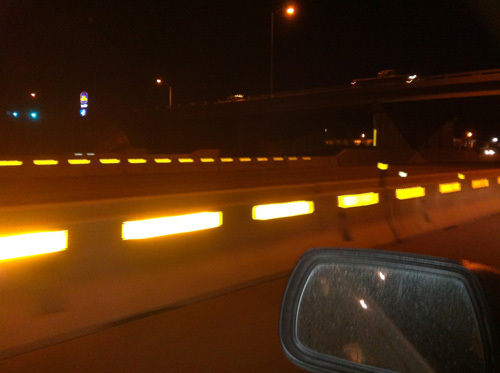 The delineators consist of reflective signing material mounted on thin aluminum plates bolted onto the barrier. The product has been used in other areas, including construction detour projects in Oregon. The agency will recess solar-powered lane delineators to avoid removal by snow plows. To improve shoulder delineation, the department will recess solar-powered LEDs into the shoulders of I-90 in both directions. The LEDs have succeeded in other areas, including New York State, California and Colorado. "The shoulder markers will actually be recessed slightly to avoid removal by the snow plows," said Melinda Warren, acting program management engineer for the Washington State DOT. "And in a short half-mile area, we’re going to install the LEDs in the skip-stripe of a three-lane eastbound section. Right now we put what I would call passive reflectors in a pavement groove, and headlights reflect off them. These LEDs will provide active light." The agency plans to assess the effectiveness of the new delineation systems for use in difficult or complex detours or work zones around the state. The department will conduct a collision analysis as part of the project with the goal of reducing the three-year average rate of fatalities and injuries by 20 percent. The agency is also looking to improve customer satisfaction with delineation in the Snoqualmie Pass. It has received numerous complaints that identify roadway marking as a problem in the pass. "We will be doing a precondition survey and a post-application survey of highway users that travel the pass," said Warren. "We hear from people with real complaints, so we have a place to start. We will conduct a robust public awareness campaign regarding construction for the Snoqualmie Pass corridor." 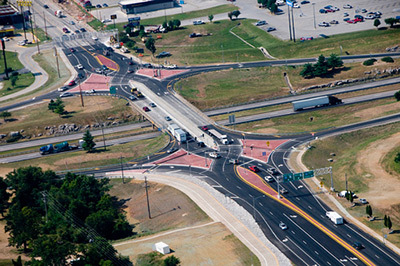 State-of-the-art intersection design, 3-D modeling and adaptive signal control technology are among the Every Day Counts innovations states are using to build a better highway system. The Texas Department of Transportation is using an innovative intersection design to reduce delay and congestion on State Highway 71 in Austin. The agency is replacing a traditional intersection with a restricted crossing U-turn, also known as a Super Street. The new design, one of the intersection types being promoted under the Every Day Counts initiative, reroutes left-turn and through traffic movements, requiring all motorists to turn right and make a U-turn at the next light. "Benefits of this design concept are tremendous," said Greg Malatek, district engineer. "The design will help reduce delay and congestion at this intersection by more than 40 percent, which makes the roadway safer for everyone." The Wisconsin Department of Transportation is on the cutting edge of 3-D design and modeling techniques. The agency developed a training plan that includes a new website, certified trainers and user groups. The website, including training materials for AutoCAD Civil 3-D roadway design software, is at http://wisconsindot.gov/Pages/doing-bus/eng-consultants/cnslt-rsrces/tools/civil3d/civil-train.aspx. A presentation on the agency’s implementation of 3-D modeling and automated machine guidance was featured at the Transportation and Highway Engineering Conference at the University of Illinois at Urbana-Champaign. The Alabama Department of Transportation is finishing three adaptive signal control technology projects. The ASCT installations-which cover 35 intersections in Montgomery, 25 in Birmingham and 16 in Huntsville—are in the system—testing phase. The highway agency selected the Sydney Coordinated Adaptive Traffic System for all three locations. The University of Auburn is performing before-and-after studies to assess the effectiveness of ASCT use. The Michigan Department of Transportation has adopted the Safety EdgeSM as a standard practice on all rural two- and four-lane highways with a speed limit of 45 miles per hour or more and no shoulder rumble strips. The Safety Edge will also be used on all temporary pavement installed in work zones. The agency took the action because of the positive results from pilot projects built under the Every Day Counts initiative. An innovative diverging diamond interchange will be included in a project to improve a section of the Interstate 15 corridor in Utah’s Washington County. The selected alternative includes widening the road throughout the project and auxiliary and collector-distributor lanes between some interchanges. Three interchanges will be reconstructed, including one that will be converted into a diverging diamond interchange to enhance safety and traffic flow. The Iowa Department of Transportation, Iowa State Historic Preservation Office, Advisory Council on Historic Preservation and Federal Highway Administration have signed a new programmatic agreement that defines how projects will be handled under Section 106 of the National Historic Preservation Act. The agreement, which updates an older version, will cut the time and resources needed to complete Section 106 reviews on projects. 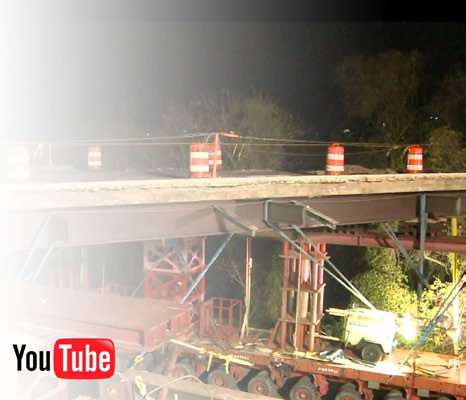 Check out YouTube to learn more about innovative technologies and practices for building highways and bridges. Video selections include a Maryland project that used self-propelled modular transporters to move a bridge superstructure into place (www.youtube.com/watch?v=XfIMfzkZSlg&feature=youtu.be) and a Wisconsin project featuring geosynthetic reinforced soil integrated bridge system technology (www.youtube.com/watch?v=frxx9J7qiWU). For the Federal Highway Administration’s YouTube channel, go to www.youtube.com/user/USDOTFHWA/videos?view=0. A pavement project on Interstate 70 in Ohio has won an award for achieving the smoothest asphalt pavement in the country. The National Asphalt Pavement Association’s 2012 award for the nation’s highest-quality highway pavement went to the Ohio Department of Transportation project paved by the Shelly Co. Southern Division of Thornville, Ohio. An Ohio interstate project paved with warm-mix asphalt has been named the smoothest pavement in the country. The project involved the milling and overlay of about 11 miles (17.7 kilometers) of I-70, beginning in Licking County near the State Route 158 exit and ending just past the State Route 256 exit in Franklin County. The pavement on this four-lane interstate through central Ohio was cracked and deteriorating when the job began. About 62,000 vehicles, 26 percent of them trucks, travel the road each day. The Shelley Co. milled 3.25 inches (82.5 millimeters) from the existing roadway before laying a 19-millimeter asphalt base course topped by a 12.5-millimeter Superpave® asphalt surface course. The company took the asphalt milled from the roadway back to its plant, where it was incorporated into the asphalt mixes used on the project. 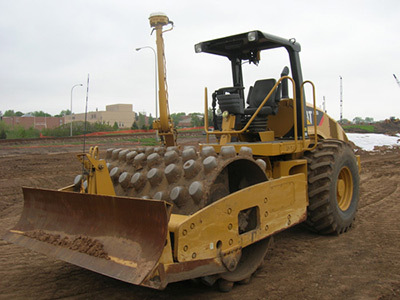 By reclaiming the asphalt millings, the company reduced the need for new aggregate and asphalt binder for the project. Company crews worked at night to minimize traffic disruptions. They laid a base coat of asphalt on all milled surfaces before ending each work shift to ensure a smoother surface for traffic in the work zone during the day. Nighttime paving and a late project start that delayed paving until cool fall weather had arrived made the project more challenging for the contractor, but using warm-mix asphalt enabled the company to achieve the desired pavement compaction and smoothness despite less-than-ideal temperatures. Warm-mix asphalt, part of the Federal Highway Administration’s Every Day Counts initiative, is produced and placed at lower temperatures than traditional hot-mix asphalt. "Warm-mix asphalt allowed us a little more time and gave us a little more flexibility, letting us compact the asphalt more easily," said Larry Shively, quality control vice president for Shelly Co. "There are also some fuel savings associated with warm-mix asphalt, and environmentally it provides better working conditions for our employees." Paving in cooler weather and nighttime temperatures did require special efforts, Shively said, including paying close attention to quality control. "The cooperation and communication between our plant and our crews and partnering with the Ohio Department of Transportation helped us make sure that everyone was on the same page and that everybody understood what was going on," he said. Finalists for the NAPA award, called the Sheldon G. Hayes Award after a NAPA founder, are determined through a two-year process. 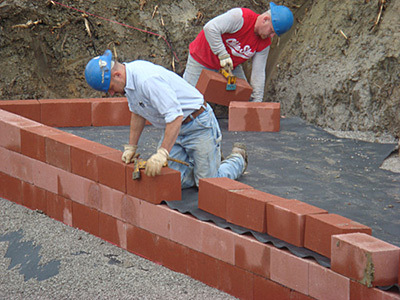 First, projects must win a Quality in Construction Award, which is determined by scores calculated by pavement engineers at the National Center for Asphalt Technology. The next year, top-ranked projects are tested for smoothness and visually inspected by an independent pavement consultant to pinpoint the winner. Make sure you don’t miss an issue by signing up for e-mail notifications at https://public.govdelivery.com/accounts/USDOTHFL/subscriber/new?topic_id=USDOTHFL_12&pop=t.